US Treasury yields stabilized, equities surged, backing some USD/JPY gains. US soft macroeconomic data limited the pair’s advance. Stable US Treasury yields and the better performance of worldwide equities underpinned the USD/JPY pair which rose to 110.68 this Tuesday. Equities closed in the green although there were no impressive rallies. US government bond yields bounced as appetite for riskier assets improved, with the benchmark yield for the 10-year note settling at around 2.41%. Safe-haven yen recovered some ground in the final hours of trading, as US indexes retreated from daily highs. Japan released at the beginning of the day the February Corporate Service Price which came in at 1.1% YoY, matching the previous month reading. The BOJ released its Summary of Opinions, which didn’t surprise. This Wednesday, the Japanese calendar will remain empty. 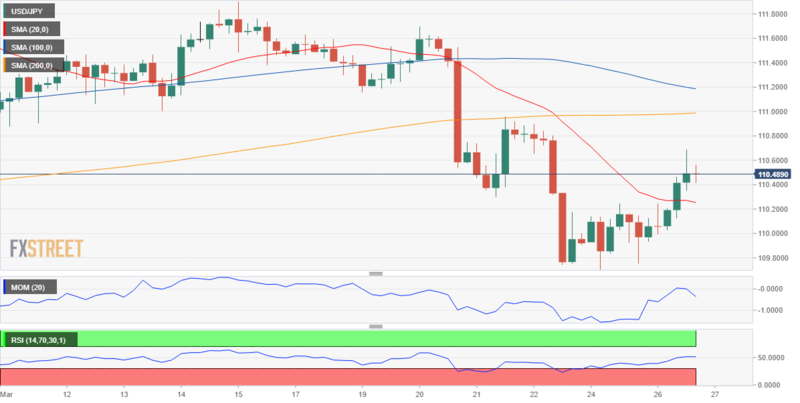 The pair is settling at around the 38.2% retracement of its latest daily slump after touching the 50% retracement of the same slide at 110.70, with a mildly positive stance in the short-term. In the 4 hours chart, the pair continues developing below the 100 and 200 SMA, suggesting that longer-term advances are still in doubt, but broke above its 20 SMA, now flat around 110.25. Technical indicators recovered ground, the Momentum maintaining its bullish slope and the RSI now flat at around 50, failing to confirm additional gains ahead, to be more clear if the pair surpasses the mentioned 110.70.